Market is expected to open higher on Monday on the hope that something by someone to save Greece on Tuesday and if the deal is not done tomorrow it will be postopne to Nov 26th as per pre announced plan. This week congress is on vacation, so there won't be any talk on fiscal cliff till Nov 25th. Everyone is trying to kick can down the road and hoping that miracle will be done at last moment. Crappy Algos look for headline and so far, whether politician do anything or not but they have promised to give good headline. 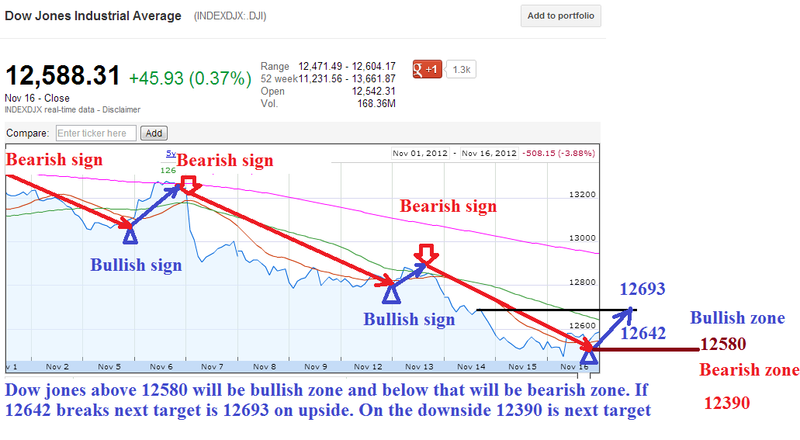 Based on chart, Dow above 12580 and S&P500 above 1354 will be bullish while below that its bearish. 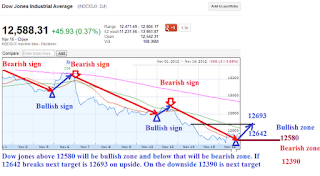 Breaking 12642 and 1364 will reverse the downtrend to uptrend of this market. So watchout this level. Dow jones is expected to open higher on Monday.